Claude Closky, Untitled (lo) - 2010, 150 x 162 cm, acrylic on canvas. Like the previous three series, from 2003, 2005 and 2007, the paintings that Claude Closky is showing today are “untitled”. Which does not suggest any dearth of identity—each series and each picture has its own existence. The title in the visual arts publicizes concrete and/or metaphorical information about what we are looking at. It is also a way of identifying one artwork from another, in an area where the object, gesture and intent produced by the artist are based on their relation to their distinctive aspect (singularity). In painting, the career of the term “untitled” is associated with abstraction—for example, Kandinsky’s 1910 water-colour marking the beginning of abstraction—and underscores the primacy of what is visible over what is spoken. It is associated with the withdrawal of the representation and of the narrative included, in favour of the pictural event : a verbal way of emphasizing that things do not need to be named in order to be seen1. This might be the first hypothesis, involving an indifference of painting to anything other than itself. But everything that Closky does is concerned with the world he lives in, as we can see in the finance-related graphs that inspired the compositions of his earlier “abstract” paintings. The term “untitled” in this new series produces a second hypothesis. Closky has painted two letters on each surface, which gets us to look at the relations between pictorial surface and language—the issue of meaning. This is a long (hi)story. The painting in western culture, has established as a surface of construction of meaning. This was the space of the historia, based on a coding of meanings suitable for identifying a narrative, at times based on writings included on the pictorial surface. By extension, the picture has become the theatre of an awareness of narrative conditions. It produced stories and it gave rise to a way of thinking about relations between the visible and the legible, about the possible equivalence between poetry and painting: Ut pictura poesis. From this relation between painting and description, let us remove narratives and the various orders of language—which, broadly speaking, is the domain governed by the title—, the rules and regulations that painting has prompted, and the successive discourses and debates that it has engendered: its laws and its commentaries. As for the presence of words on the pictorial surface, this often creates confusion. There is a gigantic saga of painted words, from Enguerrand Quarton to Olivier Mosset (to adopt the speed of light). Modernity and after has shifted from a text accompanying the image to a text as an image, and this text, paradoxically, expresses meanings which the materiality of painting holds back. But this is not so with Closky’s pictures, where the two letters fill the surface and produce just one syllable devoid of meaning. So flops hypothesis number two. Closky usually removes signs from their customary circulation, isolates them, or slows them down in an operation of detachment which scales down the sense, regulates the flow as low as possible, like a raw material which he transforms but not transfigurs. Recourse to “untitled” in these four series indicates a threshold, where painting mobilizes a particular status of language in art, and in Claude Closky’s work especially. The paint itself suspends the content and diverts it towards a misleading modernism, a false abstraction. The financial curves and graphs have lost their abscissa and ordinates, and language is nominally summoned to say nothing. Closky makes the painting a surface that blocks meaning, all at once a plane of separation and materialization, and a space of tension between irreconcilable poles. Holding back meaning is not so simple, but quite a few artists have tackled the problem. These compositions are linked with the tradition of the opaqueness of signs as opposed to the transparency we sometimes supposed they have: the inscription takes precedence over what it conveys. Closky also practices montage with paper collages which expose their main operation: cutting. 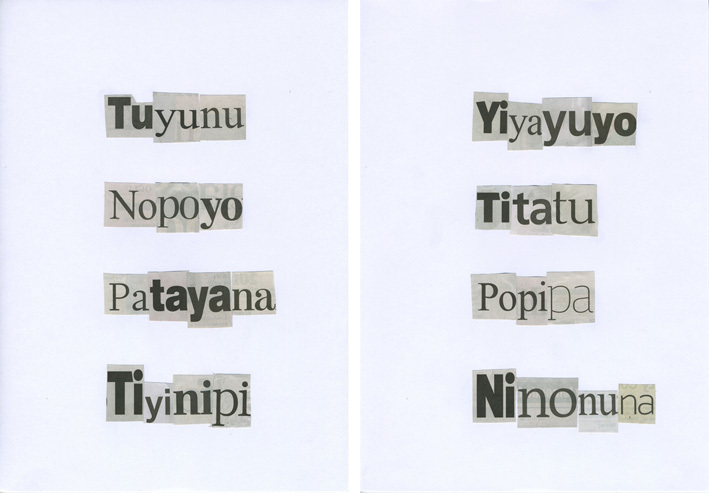 In the collages of syllables on view here (Lalolilu, etc.) he has taken bits of words printed in newspapers, and put them back together based on a new rule. The terms that result therefrom are devoid of meaning. In the pictures, the syllables -a consonant and a vowel - have been disjointed by the distribution of colours on surfaces forming letters and ground. Our reading is upset, objectless. Nor do we instantly recognize the standardized naturalism of the colours which belong to the vocabulary of the landscape: green field, blue sky, black tunnel, yellow sun, and so on. Landscape and onomatopoeia have no kinship, and the pictures bring them together without unifying them. The outcome is disconcerting and not very spectacular--enigmatic and common-or-garden, just like life. The last hypothesis. In this series, painting is perhaps there to be useful to the text, or rather, to enable the text to take shape. It exempt signs saying nothing, and rings out a sort of visual pitch. The rough-and-ready dismantlement of the printing characters and the descriptive codes of the colour co-exist. The surface of the picture brings them together without muddling them, well removed from any traditional symbolic operation which might be based on the promise of a reconstitution. Words and texts are absent, nature is faraway. Closky represents the dissociation of signs and meaning with the same signs which have the task of adjusting meaning. As for the picture he makes of it, there is no description to take its place. “The fact is that the image is not defined by the sublimeness of its content but by its form, i.e. through its “inner tension”, or by the strength it galvanizes to make a void or make holes, loosen the grip of words, dry the oozing of voices, and become separate from memory and reason […]. Gilles Deleuze, “L’Epuisé”, postface to Samuel Beckett’s Quad, Minuit, 1992. 1 There is a black-and-white video installation produced by James Coleman in 1998-2002 to which he refused to attach the expression “untitled”, so that the spectator’s questioning would remain total. This is the only example, to my knowledge, of an open opposition to language in the identification process attendant upon an artwork.